THE evidence is hardening that the United Airlines flight 93 was shot down or met an end other than stated by the U.S. Government in the skies above Pennsylvania on September 11, 2001. I have commented in earlier items about the discrepancies. Today The New York Times published the transcripts of all three other doomed planes, while they note that the transcript of the voice recordings relating to the United Airlines 757 which crashed at Shanksville has been withheld by the F.B.I. This seems to confirm my view. Read what The New York Times authors write in their piece excerpted below -- as close as any U.S. journalists have yet dared to venture to the truth. The newspaper has pieced together an Interactive page relating to this flight's final minutes. Now see the odd words highlighted by us in red , timed 10:04 a.m.-- "Last observation of primary target". That looks like a message from a fighter plane. We recall that Vice president Cheney confirmed that President Bush had given authority to shoot down hijacked airliners at 9:53 a.m. I am baffled by the failure of the U.S. journalists to do their proper job of investigation, and to print the truth that they find fearlessly. They will earn no Pulitzers, probably, but they will earn the respect of their peers. Just minutes before the crash at the Pentagon, United Airlines Flight 93, flying from Newark to San Francisco, went off course near Cleveland. It now appears that Flight 93 received a warning of the hijackings. Cutting through the background noise in the cockpit of Flight 93, the crew would have heard the sound of an electronic "ping" like one that might announce the arrival of e-mail message on a home computer. It was a text message coming by radio, from a flight dispatcher near Chicago. In green letters on a black background, it said, "Beware, cockpit intrusion." The message was sent by a dispatcher, sitting at the "transcontinental" desk at United's operations center near O'Hare International Airport, who had been assigned to follow both 175 and 93, as well as 14 other airplanes that morning. After United 175 was confirmed to have been hijacked, he sent the message to all the planes he was monitoring. 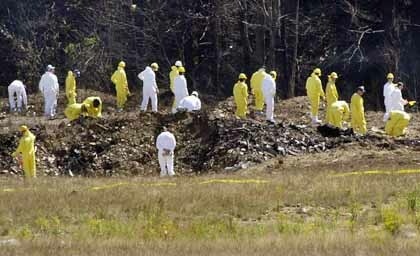 Since Sept. 11, details have emerged of a struggle between hijackers and passengers on Flight 93. People involved in air traffic control said the F.B.I. seized the air traffic tapes of the conversations with that airplane, and no transcript was made available of air-to-ground communications for the flight. But according to a person who heard the tape, "a very noisy sound of a confrontation was heard on the frequency, very garbled, but with some discernible phrase like, "Hey, get out of here!" There was the sound of a foreign language on the frequency; controllers thought it was Arabic. Flight 93 crashed in a field western Pennsylvania at 10:10 a.m. But before the final cockpit intrusion of the morning, one of the pilots apparently turned to the e-mail unit that carried the warning from Chicago, touched a button that made the screen display a keyboard and typed a one-word reply: "Confirmed." Flight plan: Newark to San Francisco. 8:42:00 Plane takes off from Newark. 9:28:19 First audible sign of problems in background cockpit noise. 9:35:09 Plane climbs without authorization. 9:36:31 Plane turns off course. Sometime after 9:30, two passengers make the first of several calls to their wives, saying that three or four passengers were discussing how they might stop the hijackers. One man on the plane also spoke directly to 911 dispatchers, relaying details of hijacking in progress. Several other passengers on the flight placed cellphone calls as well. Investigators who have heard the cockpit voice recorder have described the sounds of a struggle taking place. 9:56:00 Last transponder code observed. 10:00:00 Controller states: "think he is at 7,500 (feet)." 10:04:00 Last observation of primary target heading of about 160 degrees.